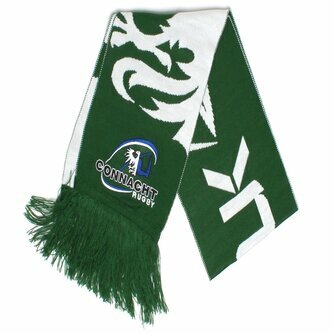 A great addition for any loyal fan, young and old can wrap themselves up in the Connacht 2014/15 Supporters Rugby Scarf. Made by BLK from soft acrylic, the scarf shouldn't just be confined to chilly match days as it's fashionable enough to be proudly worn on any occasion, all year round. Presented with a well recognised green look - associated with Connacht's kits since the 1950s. There's also plenty of white on show and the Connacht badge features along each side. Speaking of which, the badge is also stitched at opposite ends for added distinction and to really show off your support.